Credit scoring is a system creditors use to determine whether to extend credit to potential borrowers. Most home buyers are also borrowers and credit scores play a key part in the transaction. Credit scoring takes into consideration a variety of information obtained from credit applications and credit reports, including bill-paying history, outstanding debt, age of accounts, and other information. Using a statistical program, creditors compare the compiled information to the credit performance of consumers with similar profiles. A credit scoring system awards points for different factors, and the total number of points, or credit score, is useful in predicting how likely it is that a consumer will repay a loan and make on-time payments. Using a credit score is one way for lenders to be more accurate, consistent, and objective in their underwriting policies. Because credit scoring is an objective system based on real data and statistics, it is considered more reliable than subjective or judgmental methods or criteria that has not been systematically tested. The Equal Credit Opportunity Act does not allow credit scoring systems to take into account certain characteristics, including race, gender, marital status, religious affiliation, or national origin. Two large investors in mortgage loans, Fannie Mae and Freddie Mac, say credit scores are proven to be good predictors as to whether a borrower will repay a loan. Lenders typically evaluate a loan application based on a borrower’s ability and willingness to repay a loan. A borrower’s ability to repay is based on information like current income and stability of past earnings. Willingness to repay a loan is evidenced by past credit history—in other words, someone who has made payments on time in past is more likely to do so in the future. For most lenders, a credit score is only one of the many factors in the evaluation process. Lenders do not generally deny a loan because of a low credit score alone—other factors can make up for a negative credit score and underwriting decisions are rarely made based on a credit score alone. A FICO score is a type of credit score developed by Fair, Isaac & Company using credit bureau information. FICO scores range from about 350 to 900, with higher scores indicating lower probability of default on a loan. Although the FICO score may be the most well-known, there are other credit scoring companies, and the national credit bureaus may construct proprietary credit scores as well. Lenders use the credit score as a tool to predict the risk of a consumer defaulting on a loan. Until recently, only lenders and others who grant credit could gain access to these scores; now, however, consumers can see their own FICO score and learn about how to improve their credit score. FICO scores (and other credit scores), however, are not part of a consumer’s credit report. The higher a borrower’s FICO score, the less risk the borrower is to the lender. For this reason, consumers with higher FICO scores can sometimes qualify for larger loans or more favorable interest rates. Many lenders use credit scores as one of the factors in determining the price of a loan. The price of a loan is the interest rate and the points charged by the lender, which can both fluctuate lower or higher depending on different factors. Credit scores may help determine the price of a loan because a borrower who has demonstrated ability and willingness to repay a loan is a lower credit risk. Borrowers with lower credit scores may still get a loan, but they may pay a higher price because the lender assumes a higher risk of default or loss on the loan. Other factors also help determine the price of a loan, including property type, property value, the type of loan, the lender’s actual costs in making the loan, and borrower’s equity in the property. For example, a borrower making a 5% down payment may pay a higher loan price than a borrower putting down 20%, since more equity in a property generally means a borrower has greater incentive to make the payments and make them on time. How are credit scores determined? Payment history: Bills that are paid late or referred for collection will reflect poorly on credit score, as will a bankruptcy. Outstanding debt: Many scoring models evaluate the ratio of debt to credit limits. If the amount owed is at the upper limits of available credit, it may have a negative impact. Length of credit history: Some models consider the amount of time a borrower has had a credit history. An insufficient credit history may have an effect on credit score, but payment history or low balances may offset a short track record. Recent credit applications: Too many recent inquiries to a person’s credit report can indicate they may have opened many new accounts, which can negatively affect credit scores. However, “pre-screened” credit offers and inquiries by companies that regularly monitor accounts would not be counted against a credit score. Credit inquiries remain on a credit report for two years, although only the previous 12 months are considered for credit scoring purposes. Requesting a copy of a person’s own report does not count as an inquiry, and multiple inquiries for a similar loan (for example, a car loan) within a 140-day period generally are counted as a single inquiry. Number and types of accounts: Established accounts are important in creating good credit scores, but too many credit card accounts can have a negative impact on a credit score. FICO scores take into consideration five main categories of information, and each is weighted according to importance. Payment history generally makes up 35% of the total score, and amounts owed makes up about 30% of the score. Other categories include length of history (15%), new credit (10%), and types of credit (10%). In addition to credit scores, creditors sometimes evaluate applicants based on additional information: capacity, collateral, and character. “Capacity” is the term used to describe how much debt a given borrower will be able to repay. To determine capacity, a lender may look at how long a borrower has been on their current job, whether they work in a stable industry, etc. They also look at current debt-to-income ratio, what kinds of debt the borrower carries (secured vs. unsecured), etc. “Collateral” includes a home, property, mutual funds—anything the borrower could use to secure or repay a debt. A borrower with a late payment history may find having enough collateral is critical to obtaining a loan. “Character” seems like a subjective call, but it can be evidenced objectively in certain matters, including how long a person has been at their current job, how long they’ve lived at their current residence, and whether they have a checking or savings account. How can a borrower improve his credit score? Since credit scores rely on credit report information, consumers should first check their credit reports from all three national credit bureaus, and then take steps to remove inaccuracies and improve their credit reports. Making timely payments is key. Credit reports can be improved when consumers pay off collections and past due amounts, pay down loan balances as much as possible, and not take on any new debt. It may take some time for scores to improve significantly—most scoring models look for a 1–2 year period with no late payments, no past due payments, and no derogatory items on a borrower’s credit report. Consumers can also minimize the number of credit inquiries (which can have a derogatory effect on credit scores) by applying for credit only when it is absolutely necessary. Finally, it is important to remember that different lenders have different strategies, so, while a higher credit score equates to a lower risk, there is no overall cutoff point to determine whether a borrower will receive credit. Different lenders have different levels of risk they find acceptable for certain types of credit products, so different lenders may have different products available for borrowers with a lower credit score. Rather than going over a card’s limit, ask for an increase. Promptly notify creditors of changes in address, so bills arrive on time. Acquire and use only the cards you need. Even if you’re not tempted to use them, creditors often frown on too many unused cards. Scrutinize pre-approved cards and other credit offers. Don’t apply because of rebates or other gimmicks; instead, make wise choices based on interest rate, annual fee, and grace periods. In this article, I’m taking a closer look at some statistics with regards to the residential real estate in Erie, Colorado because that is where I live and my kids go to school. So, the Erie residential real estate market is near and dear to my heart. The spring selling season is starting to heat up as the number of active listings went from the mid-80s over the winter months to 111 as of the writing of this article. The 111 active listings for Erie in REColorado (MLS) range from $2.9 million to $264,900 for a 2 bedroom, 1 bathroom condominium. New construction accounts for 39 of these listings (35%), which is indicative of the growth of Erie and the demand for new homes. Prices in Erie seem to be on the rise too. The average list price for homes in Erie is $619,140, so far in March 2019. I also find it useful to look at some statistics with regards to the Erie real estate market over a longer period of time. Erie’s rapid growth makes historical comparisons over a number of years difficult and a little like comparing apples to oranges. Nonetheless, I think this information is useful for buyers and sellers in Erie so they can get a feel for trends in the local real estate market. The median sales price in February 2019 was actually down ($491,470) compared to the last several months as shown on the graph below. However, these medians can be skewed by a couple sales at lower than typical prices, and are likely explained by the annual seasonal slump over the winter months. The median sales price for the last six months in Erie was $506,969. The median list price is the other half of the picture. As to list price, the six month trend seems to support a conclusion that list prices in Erie are on the rise. The median list price in February 2019 ($550,000) actually exceeded the list price in September 2018 ($539,950) which was the tail end of the seasonal selling market. It’ll be interesting to see if this trend holds true to form and list prices (and sales prices) continue to increase in the more active spring and summer market. Another metric that buyers and sellers find useful and important in the residential real estate transaction process is the ratio at which homes sell compared to their list price. In other words, the percentage of the list price at which homes actually sell. In the residential real estate market in Erie for 2018, that ratio was 97.9% In other words, homes in Erie are selling for very close to list price, so a “low ball” offer probably won’t get you a home in the present market conditions. The final statistic that I will be examining in this article is the average days on market (DOM). This tells sellers about how long they can expect for a typical home to be on the market before it goes under contract with a buyer. At the peak of the market last year, some homes were going under contract in a matter of hours. One of my listings in Vista Ridge went under contract based upon the “coming soon” sign before the professionally photography could be completed and the home could be entered into the MLS. Over the winter months, the days on market unsurprisingly increased. For 2018, the twelve month average for days on market in Erie was 22.3 days. Interestingly, the average days on market for the first half of 2018 was 17.5 days and the average days on market for the second half of 2018 was 27.2 days. It may be that as list prices and sales prices are increasing in Erie, so too are the average days on market. I will be curious to see the average days on market for Erie during the 2019 spring and summer markets. Stay tuned for more market updates and statistics on the Erie residential real estate market. If you have a specific statistic or questions about the Erie real estate market for which you have questions, don’t hesitate to ask. More Americans are becoming homeowners. The national home ownership rate increased slightly to the highest level since 2014 in the fourth quarter of 2018, reaching 64.8 percent, the U.S. Census Bureau reported this week. The home ownership rate has been gradually increasing since reaching an all-time low of 62.9 percent in the second quarter of 2016. Researchers at data analysis firm CoreLogic attribute the housing market’s “healthy path of recovery” to three main factors: An uptick in home ownership that has been persistent “despite the existence of low housing affordability and inventory;” household formation that has been on the strongest streak in more than a decade; and an increase in the rate at which young households—who represent the largest pool of potential buyers—are entering home ownership. The home ownership rate of young adults ages 34 to 44 rose 1.2 points year over year to reach 61.1 percent in the fourth quarter, the largest gain of any age group. Young adults are increasing their stake in the housing market, but it’s not happening everywhere. Millennials are buying homes at the highest rates in more affordable areas, and they’re buying homes at the lowest rates in the priciest pockets, such as coastal California and Florida. Millennials comprise the largest share of purchase mortgage applicants in Pittsburgh (57 percent); Provo, Utah (56 percent); and Rochester, N.Y. (55 percent). However, they make up the lowest share of mortgage applicants in Sarasota, Fla. (24 percent); Cape Coral, Fla. (30 percent); and Ventura, Calif. (32 percent), according to CoreLogic research. Overall, the Census Bureau data shows that in the fourth quarter of last year, owner-occupied households rose by more than a million, to 1.7 million new owner households. Also, the number of new renter households is decreasing, which suggests that some households are switching from renting to owning, according to CoreLogic. Now that the 2019 professional football season has ended, a lot of people will turn their attention to buying and selling a home. What will it take to make your home stand out from the others in the neighborhood? Here are a few tips on simple items that can be done to increase the appeal of your home for potential buyers. The first thing a buyer sees is the front of the home. An ill-kept yard can create a negative opinion of a home. Make sure to trim all trees and bushes so the front of the home can be seen. If you add mulch, add it a few days before an open house so the smell is not as strong. Clean and paint the front door. Buyers often linger in front of the door and it’s the first impression of the home. Make the interior of the home seem light and airy by doing some simple touches throughout the home. Clean the drapes, linens and blinds. Open the windows during an open house. Bring in fresh cut flowers for a pleasant smell. Polish floors and clean all carpets. Add light colors throughout the home with towels, throws and pillows. Eliminate some of the clutter in a home to give the impression of extra space. Put extra items in storage or donate unneeded items. Having only a few items in a closet makes it appear much larger. Doing a few upgrades around your home before putting it out on the market could add extra dollars and generate more interest in the home. Upgrading appliances in the kitchen such as the refrigerator or stove can add extra appeal to a kitchen. Repairing and restoring finishes throughout the home or purchasing higher quality finishes can make a big difference as well. Adding new door handles to kitchen cabinets is another inexpensive option to update a kitchen. Get ahead of the game and fix things that may come up in an inspection. Nip any potential problems – from outdated electrical wiring to pest infestations. Make sure to service your air conditioner and have your water heater and furnace serviced if needed. Just as your front yard makes a big impression to potential buyers as they drive by your home, the back yard is also another impactful area that many consider an additional entertaining space. Remove extra clutter in the backyard and replace any outdated or damaged furniture. Also, make sure to paint your deck if needed or repair any cracked concrete that may be noticeable. As a professional Realtor, I spend time in each room in your home and carefully examine the exterior of the home to prepare a detailed list of recommendations intended to help attract potential buyers to your home, ensure your professional photos are of the best quality, and help you realize top dollar from the sale of your home. A title insurance company may be willing to insure your real estate transaction without requiring a survey, especially in urban and suburban subdivisions. This, however, should not be the deciding factor on whether a survey should be performed. A key consideration is whether or not you plan on making improvements to the property such as an addition, garage, shed, or fence. Survey issues often arise when a new owner requests a permit from the local permitting authority. A survey may reveal that the permit cannot be approved because the desired improvements encroach onto adjoining land, the buyer does not own portion of the land, there is no recorded or legal access to the land, or the improvements are not constructed on the land. What does a survey disclose? access to the property by way of an abutting public street, or easement (physical access may be different from the legal access insured by the policy). There is a distinction in the real estate contract between a “current” survey and an “existing” survey. A current survey is a survey with a date of certification by the surveyor contemporaneous with the transaction. An existing survey is a survey prepared for a prior transaction and the date of certification is not contemporaneous with the transaction. There is an important distinction between the two forms of survey in the context of the termination of the contract. The buyer can terminate the contract by objecting to any unsatisfactory matter with a current survey. The seller has no right to cure the defect. However, an existing survey falls under Section 8.2 (Off-Record Title matters) which allows the seller the opportunity to provide a resolution to the unsatisfactory matter, failing which the contract may terminate. What are the contract terms for surveys? Section 9 of the Contract to Buy and Sell Real Estate (Residential) (1-9-12) provides for the Seller or Buyer to obtain a current survey (i.e. an Improvement Location Certificate or Improvement Survey Plat). The Buyer may terminate the Contract on or before the Current Survey Objection Deadline, if the current survey is not received in a timely manner by the Buyer or based on any unsatisfactory matter with the current survey. The Seller is required to deliver to the Buyer as part of the Off-Record Matters, true copies of all existing surveys in Seller’s possession pertaining to the property. The Buyer has the right to object to any adverse matters disclosed by the existing survey or terminate the Contract by delivering a Notice to Terminate or object by delivering a Notice of Title Objection to the Seller. The title insurance company may agree to delete the survey exception using various guidelines based on the risk to the title insurance company. These guidelines vary depending on the type of use of the subject property. The guidelines listed below are general in nature and will differ between the different title insurance companies. In general, no survey will be required to delete the survey exception in policies for residential properties if the residence is in a platted subdivision, i.e. the property is described by lot and block. If a survey was prepared for a prior transaction and this survey is provided to the title insurance company, it will be accepted with an affidavit from the seller that there have been no changes to the property since the date of that survey. If the property is described by metes and bounds (i.e. the property is not in a platted subdivision); or there has been recent construction which affects the footprint of the improvements in relation to the property and easement boundaries. There are a number of different types of survey that may be acceptable for this purpose, depending on the nature of the transaction. Improvement Location Certificate: This is the least expensive of the types of surveys available. It is typically used in the purchase of single-family residential property located within the established subdivided urban and suburban areas. However, it is based on assumptions regarding the boundary location based upon the professional land surveyor’s general knowledge of land boundaries and monuments in the area, and is not a precise survey. It will depict the property boundaries and the improvements, as well as any encroachments and easements and will be signed and certified by a land surveyor. Land Survey Plat: The land survey plat will include a scale drawing of the boundaries of a parcel of land, all recorded and apparent rights-of-way and easements, all dimensions as surveyed, the written property description, north arrow, scale used, description of all monuments used, and the completion of the prescribed certificate by the land surveyor. Improvement Survey Plat: An Improvement Survey Plat means a land survey plat as defined in the statute (see above), resulting from a monumented land survey showing the location of all structures, visible utilities, fences, hedges or walls situated on the described parcel and within five feet of all boundaries of such parcel, any conflicting boundary evidence or visible encroachments, and all easements, underground utilities for which properly recorded deeds are available from the county clerk and recorder or title insurance company (i.e. from the commitment). “Should I rent or should I buy?” It’s a question that real estate and lending professionals encounter often. Traditional wisdom holds that buying a home is more advantageous than renting. However, because renting does provide unique benefits in certain situations, prospective buyers today can make the most informed decision by completing a detailed cost–benefit analysis, as well as weighing the non-financial pros and cons of home ownership. In most cases, the scales will be tipped toward purchasing real estate instead of renting it. Here are some of the financial and non-financial benefits to home ownership, along with a few quick calculation tools that may come in handy for the first-time homeowner. Tax benefits: All interest paid on a mortgage is deductible for state and federal income tax purposes. State and local property taxes are also deductible. Stable housing costs: When a purchaser takes out a 30-year fixed rate mortgage, the mortgage payment will typically stay about the same for the life of the loan. Taxes and insurance may change, but the principal + interest payment will not. If interest rates go up, the payment amount doesn’t change; however, if interest rates drop, the homeowner has the option of lowering the payment by refinancing. Additionally, rents typically increase right along with a renter’s paycheck, whereas homeowners can watch their salaries increase while their housing costs remain stable. Investment appreciation: While different areas of the country experience different rates of appreciation, real estate appreciation historically has kept pace with and usually exceeded the rate of inflation. Historically, homes have appreciated at an average rate of about 5% per year, although some years can be more and others less. And of course this figure varies from market to market. Equity: When a homeowner pays rent, the money is gone, never to be seen again. But the money paid into a mortgage builds equity the longer a homeowner stays in the home. At first, the amount paid toward principal is usually a small percentage of the house payment. However, the larger amount of interest paid can be written off as a tax deduction, and, over time, the equity grows as the principal-to-interest ratio changes (and the property value appreciates). Lifestyle benefits: Homeowners experience greater freedom and privacy than their renting counterparts. A homeowner is free to change and improve his home without restrictions from a landlord. There is also usually more privacy for homeowners, since a landlord does not have access to enter the property for inspections or maintenance. Homeowners also have the chance to experience greater stability and involvement in their community, since they are putting down roots. The homeowner’s tenancy is more secure, without worries about new ownership or rent increases. Finally, a fixed-rate mortgage provides predictability of future housing costs, an advantage when it comes to financial planning. Home ownership is a bigger financial responsibility than most people realize before they have owned a home. In addition to the large investment required as a down payment (sometimes as much as 20%), buyers need to pay for the appraisal, credit report, points, closing costs, and additional fees. Buyers of a new home may discover they need to landscape the yard, install window coverings, and acquire appliances. Those purchasing an older home may be astonished at the cost of upkeep and repairs, especially if they remodel one or more rooms. In addition to the monthly mortgage fees, homeowners will need to pay one of more of the following: taxes, private mortgage insurance, homeowners insurance, and/or homeowners association fees. Although the cost of these items is often offset over time by tax benefits, appreciation, and growing equity, the cash required to purchase and maintain a home can be daunting and may not be practical for certain individuals. Renting is a practical lifestyle choice for some people who do not want the responsibilities of home ownership. People who move frequently, have credit problems, or cannot afford the home they want are good candidates for renting. Some people simply desire not to have the responsibilities of maintaining a home. Since the landlord or property owner assumes the cost (plus time and energy) of maintenance and repairs to the property, many renters enjoy the ease of living in a rental. For some lower-income families, the tax benefits are not great enough to outweigh the additional costs of home ownership. Finally, less cash is required upfront to move in. Renting, of course, means writing a check each month with no chance of seeing it again. There is no return on investment and no tax benefit to the renter. Unlike the stability of a 30-year mortgage, rents can increase on a regular basis. Renters are also subject to the sale of their building and the possibility of having to deal with new management. The following charts can help assist a first-time home buyer in comparing monthly ownership expenses with the cost of renting. 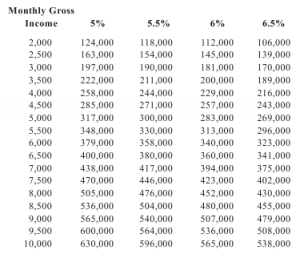 Now compare line 9 in this table with the monthly rent on a comparable place to see which costs more — owning or renting. To determine the monthly payment on your mortgage, simply multiply the relevant number (or multiplier) from the table by the size of your mortgage expressed in (divided by 1,000) thousands of dollars. For example, if you’re taking out a $100,000, 30-year mortgage at 6.5 percent, you multiply 100 by 6.32 for a $632 monthly payment. You can ask a real estate person, mortgage lender, or your local assessor’s office what your annual property tax bill would be for a house of similar value to the one you are considering buying (the average is 1.5 percent of your property’s value). Divide this amount by 12 to arrive at your monthly property tax bill. How Should Buyers Take Title to Property? All four versions of the Contract to Buy and Sell Real Estate allow for a choice in the way in which two or more Buyers can take title to the property purchased in Colorado. The choice is either to take title as tenants in common or in joint tenancy. Under Colorado laws, unless the deed states otherwise, two or more people will be presumed to hold title as tenants in common with an equal undivided interest in the property. Each co-tenant has a non-exclusive right to possession of the property, bur an exclusive right to sell, mortgage, or otherwise deal with the property, without the consent of the other co-tenants. Co-tenants can hold title in different percentages, by stating this in the deed conveying title to the co-tenants, or in a deed between themselves. On the death of a co-tenant, the co-tenant’s interest passes to the heirs who will hold title in common with the other co-tenants. Probate must be opened and and a personal representative appointed to convey the interest of the deceased co-tenant. If the co-tenants cannot agree on the sale or management of the property, a court action can be filed for a court order to partition (subdivide) the property and award the subdivided units to each of the co-tenants, usually based on the percentage each co-tenant owns. If the property cannot be subdivided, the court can order the sale of the property and the net proceeds divided between the co-tenants, based on the percentage each co-tenant owns. The court may make any order deemed necessary to completely adjudicate the dispute. It is common for tenants in common to enter into an agreement regulating their rights and duties. A common example is a jointly owned vacation homes. The agreement may (1) grant a right of first refusal to the other co-tenants should one of the co-tenants wish to sell, (2) provide for the sale or lease of the property by all co-tenants, (3) set out the terms of periodic use by each of the co-tenants. Joint tenancy is also a form of co-tenancy, where two or more persons may own a property. The important difference is that a joint tenancy includes the right of survivorship. On the death of a joint tenant, the surviving joint tenant(s) will own 100% of the property, without the need for probate to appoint a personal representative, and a personal representative’s deed to convey the interest of the deceased joint tenant. For example, if three persons own a property as joint tenants, then on the death of the first dying, the remaining two owners will continue as joint tenants. The very strict requirements of C.R.S. 38-31-101 must be followed to create a joint tenancy. The abbreviation “JTWROS” and the phrases “as joint tenants with right of survivorship” or “in joint tenancy with right of survivorship” can be used. There is not joint tenancy if this is not done. Probate must be opened to convey the interest of a deceased co-tenant. This is a very common error when the wrong choice of tenancy is made in the contract, or when the deed is signed without checking that the property is conveyed to the Buyers as joint tenants. Co-tenants, at any time, can covert their tenancy to joint tenancy by deeding to themselves as joint tenants, provided that the correct terminology is used. The interests held by joint-tenants, like co-tenants, is presumed to be equal, but the joint tenants can agree on unequal interests in the deed conveying the property to them. 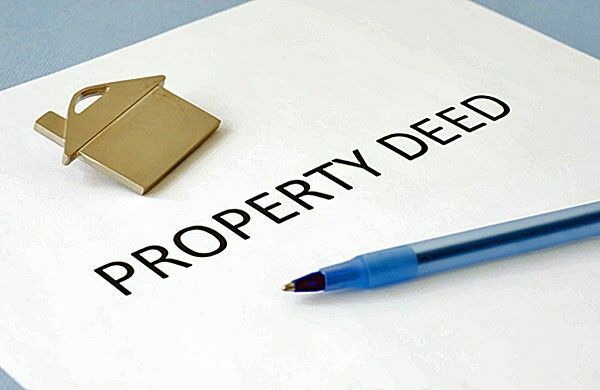 On the death of a joint tenant, a certified copy of the death certificate, or verification of death, together with a supplementary affidavit, must be recorded to prove the death of the joint tenant and to show that the surviving joint tenant(s) are the owners of the property.